This SunFresh Recipe diet takes “natural” to a whole new level by using only the freshest, highest quality sun-grown grains and plant proteins to give birds the wholesome, healthy goodness and fresh taste they deserve. Made from natural plant-based ingredients FREE of all animal proteins and fats, it contains all the quality nutrients necessary to produce strong, healthy, beautifully colored birds. SunFresh® Recipe Natural Plant Proteins FREE of all animal proteins and fats for healthy, happy birds. Superior Nutrition Strong Start, Uniform Growth and Great Appearance Consistent superior nutrition for optimal growth and great-looking birds. Essential Amino Acids Delivers Top Muscle Development, Growth and Vigor Enhanced with lysine and methionine to give birds the healthy nutrients they need to grow strong and active. Proprietary Level of Vitamin E Supports a Healthy Immune System A strong level of Vitamin E helps birds ward off disease. Exclusive Level of Marigold Extract For Brightly-colored Beaks, Shanks and Overall Appearance A high level of xanthophyll, a natural coloring agent derived from marigolds, ensures bright coloring for a beautiful flock. Key Level of Vitamin A Strong Reproduction and Overall Health Strong Vitamin A fortification helps birds grow into healthy breeders. Complete and Balanced Wholesome Nutrition with No Supplements Necessary Top nutrition requires no supplementation – all necessary nutrients are present. Certified Natural Assurance of Quality – It’s Nutrition You Can Trust Our guarantee that this is the very best feed providing safe, natural nutrition for poultry. Caution: Store in a dry, well-ventilated area free from rodents and insects. Never use moldy or insect-infested feed. 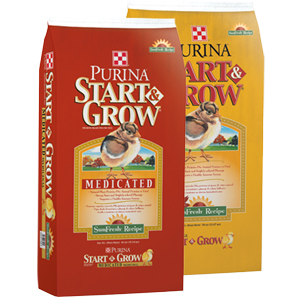 Feed Purina Mills® Start & Grow® SunFresh® Recipe as the sole ration to free-range and confined chickens (including backyard egg producers, small to medium breeds and fancy and exotic breeds) free-choice from hatch until laying age (18-20 weeks). At 18-20 weeks of age, feed Purina Mills® Layena® SunFresh® Recipe free-choice. Important: A feeding program is only as effective as the management practices. Actual results can vary depending upon feed intake, environmental conditions and the quality of management practices.